:: Raspberry Moon gets a facial in the Big Easy - and it was anything but! :: Get our Milk 'n Honey Extravaganza for just $65 - only til Thursday! I thought the main article in this month's newsletter will be the first in a series. Over the last year I have been trying out different places for facials so that I can see how I can improve, and as a reminder of the things that I am doing right. I ended up having so much to say about my recent facial experiences and what I expected that I had to break this up into several pieces. I'll share more thoughts in the coming months. These are just my opinions on what makes a good treatment, what you as the consumer should expect, how tipping works, and what makes a good Esthetician. I try facials locally and whenever I travel. I love to see what other people are doing and hopefully learn something new. Over the last several months I have learned a new eye treatment and found some fabulous sheets from my girlfriend, Alicia at Kara Spa. I had a very nice facial at a local doctor's office that was surprisingly very relaxing and with products that I have never tried before. I had several mediocre facials. Sometimes the facial itself was nice but I didn't like the products. I like when I can experience a new product line. All these visits are a reminder for me what constitutes a good facial and an awesome one. Read on in the next section to find out what happened when I visited a spa in New Orleans. Don't miss our Milk 'n Honey Extravaganza offer, below. A fabulous 90 minute treatment with a facial, eyebrow design, and Milk 'n Honey Collagen masks for lips, eyes and neck. Regularly $125, just $65 until Thursday only - that's nearly half price! Makes a great gift for mom, a birthday girl (or guy), or that special someone! This deal is only available for purchase from today until Thursday. After you purchase your deal, call or email us to schedule your appointment. Your appointment doesn't have to be booked this week, but you must purchase the certificate by Thursday. Through the month of April everyone that experiences one of our facials will receive a "Try Me" Package that includes a sample size cleanser, toner and moisturizer for your skin type from our new Saucy Chica Skincare line. This is a wonderful way to try our new skincare products! I'm so pleased to announce that my friend Ryan Holmes with Hands on Healing has joined our team! He is fabulous. If you are a new Hands On Healing client you can experience his amazing massage - he is offering a complimentary 30 minute massage but you can upgrade to an hour for only $40. He is in the office Monday, Wednesday, and Friday by appointment. Call him today at 864-423-1496 to schedule a wonderful treatment! Raspberry Moon gets a facial in the Big Easy - and it was anything but! I had a facial in August while on my trip to New Orleans. I bought it on Groupon for $37, but I checked out the website first - it looked like a nice place. I called them and they had several Estheticians, so my Mom, her friend Susan and I could all get our facials at the same time. I was a little leery when the receptionist could not tell me if they offered add ons like an eye, lip or hand treatment. I also asked if they needed us to come early to fill out any paper work - "No." So here is what my experience was like and my view of what you should do if this happens to you, as well as what I expect from a facial. We entered the spa a few minutes before our appointment and looked around in the retail center. My Mom and Susan were greeted by their Estheticians and taken promptly to the spa side of the facility. I waited 15 minutes for my Esthetician to show up. The owner did ask if I wanted anything to drink while I waited, which was a nice offer. Finally, I was taken back for my facial. The Esthetician never left the room for me to change clothes. I am not a modest person, but I do expect you to step out of the room to allow me some privacy. I never filled out any paperwork, was never asked if I had allergies, or if there was anything I wanted from the facial, if I was having any problems, or anything. But I didn't say anything because I try to be quiet and not tell people what I do for a living - I want them to treat me like everyone else so I learn more. She proceeded to pick products that she felt were appropriate. The wipes she used had strings that kept dragging across my face - they just felt really weird. Then she used a facial brush. Note: When your client keeps dodging the brush perhaps you are being too aggressive. One of the other Estheticians interrupted her for some reason during my facial, not sure why. She did a little massage and had good hands so I thought, "Ok it is going to get better now." Wrong! She finished the massage in about 5 minutes. I should say that through the whole treatment so far she has had a steam machine blowing steam in my face. She then applied some type of acid or enzyme to my skin, added steam towels to my neck and face - remember she still has the steam on my face. It's just not necessary to leave steam on the face for an extended period. Yes, we want to open and cleanse the follicle but a few minutes works just fine. Plus, using steam towels and a steam machine is overkill. I love steam towels but I'm not a fan of the steam machine - it doesn't equally steam the entire face and I feel like I can't breathe very well when one is used. The room gets very quiet. I thought, "Surely she did not put this tingly stuff on my skin and all this steam and leave the room." Wrong again! I had to move the steamer and take the hot towel off my face and throw it in the sink. If your Esthetician puts an enzyme or acid on the skin she should mention that something might be tingly and she should stay in the room when those types of products are applied. If for any reason they do need to step out of the room you should be told and asked if you are ok. I looked at the clock - over 5 minutes later she finally returns to the room on her CELL PHONE! This was the last straw for me. She asked me if there was a problem - I said "YES - you put some kind of acid on my skin, added all this steam and then left the room for over 5 minutes." Then her cell phone rang and she answered it again. She got kind of snappy with me and tried to justify her actions. We had a few words and she finished her treatment. She never left the room so that I could get dressed. I'm not sure she put any sunscreen on me either. I did talk with the owner after the receptionist asked me how the treatment was. The owner defended the action of her employee and said she was one of her best Estheticians and no one has ever complained about her before. She did ask if there was something she could do to fix it. I told her no, that I was not from there and I did not want something - I just expected a much better treatment. This would have been a $75 treatment! The only thing she said that she would talk to the Esthetician about is the use of her cell phone. I think that when you are in a larger facility your services should be pretty similar. All 3 of the facials we received at the location were very different. So I did learn something from this experience - it was a great reminder what NOT to do to my clients. We are carrying a new line of stylish, fun accessories made from recycled material, upcycled material, vintage bits and pieces and other fun things. These items are made by 3 fabulous Chicas - Brandy, Melissa and, of course, Me! 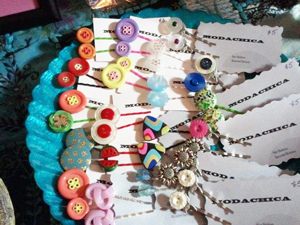 Right now we have hair bobbins, necklaces and earrings. You never know what you might find. Get our Milk 'n Honey Extravaganza - only til Thursday! This 90 minute extravaganza would normally cost $125, but we're offering a special price - through Thursday only - of just $65! Buy one for yourself and as many as you'd like for gifts - Mother's Day is just around the corner! To purchase, click the button below or get the offer here. This deal is only available for purchase from today until Thursday. After you purchase your deal, call or email us to schedule your appointment. Your appointment doesn't have to be booked this week, but you must purchase the certificate by Thursday. Sweep away tap water impurities while protecting skin from damage with red wine extract. The antioxidant power of tannins, polyphenols and other substances in red wine neutralize free radicals. Fruit acids are naturally occurring and they are found in a variety of fruits, such as grapes, apples and sugar cane. Use of glycolic products will improve oily and acne prone skin and decrease the appearance of fine lines and wrinkles. For all skin types except sensitive. Red Wine: The antioxidant power of tannins, polyphenols and other substances in red wine neutralize free radicals. Grape extract (a fruit acid): Reduces redness and inflammation. Grape seed extract: Supports blood vessel health, and healthy circulation means glowing skin! After cleansing, apply toner with cotton pad to remove residue from cleanser, makeup or hard water. Follow with appropriate protective treatment for skin type. Keep out of your eyes. Water, Organic Red Wine Extract*, Glycolic Acid*, Witch Hazel Distillate*, Oat Extract*, Hyaluronic Acid*, Extracts* of Nettle, Melissa, Elderflower, Cleavers, Plantain, Rose Distillate, Sunflower Seed Extract*, Zinc PCA (Amino Acid Derivative). *organic, wild crafted and sustainable sources. carbon balanced. $25 for 8 oz pump - Save 10% through the month of April, only $22.50! This is a wonderful moisture replenisher for the skin. Mash half an avocado and apply a layer about 1/8 thick to your clean face. Let sit for 20-30 minutes.